July, you seemed so far off, and now--well, you are here. 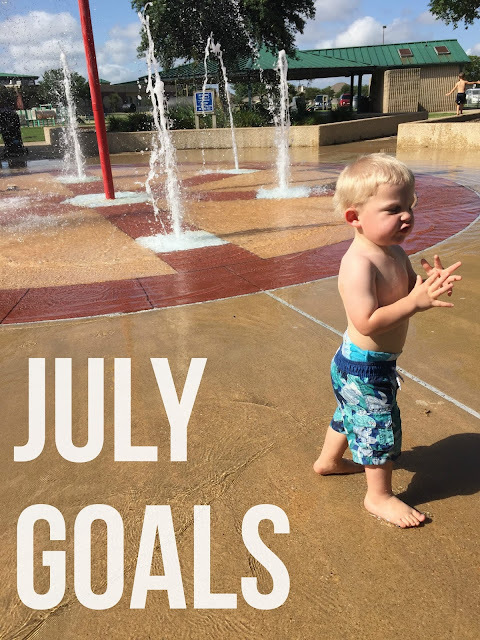 I totally missed writing out June's goals. So, we'll just pretend that I cleaned out closets, worked out everyday, ate clean, and read fifteen books. I mean, I definitely did not watch too much TV, eat cheese for every meal, make naps a solo sport, and marathon eat to keep the nauseousness at bay. Kidding aside--I'm thankful for a new month, new energies (hello 12 weeks today! ), and new projects that I actually have the energy and motivation to do. Blog about baby number two. I know that I won't keep as much of a record with this pregnancy as I did with Luke, but I still want to make an effort to write down thoughts, experiences, and how I am doing. Finish new shop product. About the time I found out I was pregnant, I also had a burst of creative energy for new products and designs. Then, of course, within days, I had no desire to do any work (unless a nap is considered work). Now, I finally have the energy to get started again. Ideally, I'd love to have my newest product in some hands by the end of the month, but I'm not pushing it. Do prenatal pilates at least once a week. Okay, okay. Once a week--I know. But, I want to start with that and move to more. Right now, I'm walking 3-4 times a week, so I'd like to add another workout to help me stay motivated to move. Create a simple cleaning schedule. Ugh. I'm horrible at keeping with the bathrooms, floor, dusting, etc..but I'm realizing that breaking it down helps me not feel so overwhelmed. So, this week, I want to scribble down a little schedule (maybe make it look cute) and try to keep up with one to two small cleaning/household tasks each day during the week. If you do this, share your secrets! That's it for July. How about you? What are your goals?